Did you know that Irish Reds get their deep garnet color from generous amounts of crystal malts? Carefully selected batches of 2 row malts are specially kilned to develop their sugars and then roasted to produce their wonderful caramel and toffee notes that accompany the rich color. You’ll find the complexity and drinkability of Saranac Irish Red to be second to none. Enjoy! OK, get out the tiny violins this is a sad story. More’s the pity, the old boy lost one. I had a fully typed out review ready to post and realized that I typed the next review over it and then saved the file. It’s gone I tell you, gone to the digital waste bucket in the sky. And why, you may ask, am I even bothering to tell you? Well, since you asked. I really did like the beer. More importantly I think a lot of people would like this beer. It was not an excellent craft beer but it was a very easy drinking, pleasant version of an Irish Red Ale. It warmed well and finished nicely. There was nothing unpleasant about this beer. I’m not going to remember what I said so I won’t even bother trying to recreate it. I do remember giving it a B- or C+. Even now I still can’t decide. This is a good beer if you are looking for an inexpensive introduction to the Irish Red Style. Nothing over the top just an good easy drinking Irish Red. OK, you can stop playing the violins now. Thanks for the review. Have you had any of our other brews? We'd be curious to find out what you thought of the Irish Stout or our main beers like Saranac Black Forest. It’s a shame I lost this one. 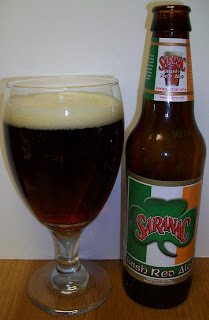 I had a paragraph or two about the wide acceptance of Saranac brews and the fact that you can but choose not to do the extreme beers; keeping your beers to something everyone can enjoy. I have not had the Irish Stout yet but I really enjoy the Black Forrest. I will add both of them to my wish list to review.